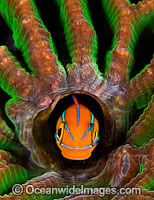 Blue-lined Sabretooth Blenny (Plagiotremus rhinorynchos), resting inside a Tube Worm hole in Brain Coral. Also known as Tube-worm Blenny. Found throughout the Indo-West Pacific, including the Great Barrier Reef, Australia. Blue-lined Sabretooth Blenny (Plagiotremus rhinorynchos). Also known as Tube-worm Blenny. Found throughout the Indo-West Pacific, including the Great Barrier Reef, Australia. Slender Sabretooth Blenny (Aspidontus dussumieri), in a hole in a sea sponge. Also known as Lance Blenny. Found throughout the Indo-West Pacific, including the Great Barrier Reef, Australia. Hairy Blenny (Labrisomus nuchipinnis), male and female mating underneath the Blue Heron Bridge in Singer Island, Florida, United States. The male is the more colorful fish. Combtooth Blenny (Ecsenius sp. 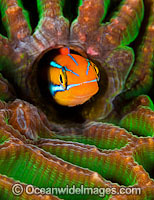 ), emerging from a hole in hard coral. Photo was taken off the island of Yap, Micronesia.